Pop. 158. In Leeds & Grenville Cs. on C. Rd. 15, 16 km. NE of Brockville. Pop. 465. In Augusta T., Leeds and Grenville Cs., on the St. Lawrence R. and C. Rds. 2 & 15, 8 km. NE of Brockville. Pop. 20,942. City in Leeds and Grenville Cs., on the St. Lawrence R. and Hwy 401 and C. Rds. 2 & 29,75 km NE of Kingston. Pop. 69. In Elizabethtown T., Leeds & Grenville Cs. on C. Rds. 29 & 42,16 km. NW of Brockville. Pop. 122. In the United Cs. of Leeds and Grenville on Kemptville Cr. and C. Rds. 7 & 30, 18 km. NW of Brockville. 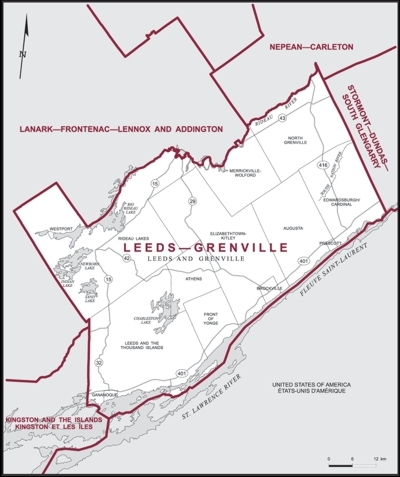 In Elizabethtown T., United Counties of Leeds Grenville, SW of Brockville. Full service bakery and deli. Fresh daily; bread , muffins, cookies, squares, fancy French pastry, sandwiches, subs, homemade soups, daily specials, and catering to small or large gatherings (fruit, veggie and sandwich trays). Pop. 144. In the United Cs. of Leeds & Grenville, 7 km. NW of Brockville. In 1905, Spring Valley post office served residents of a nearby community called Tincap because its schoolhouse had a tin-covered cap on its roof. Pop. 258. In Augusta T., United Cs. of Leeds and Grenville on C. Rds. 18 & 26,7 km. NW of Prescott. Pop. 205. In Augusta T., Leeds and Grenville Cs., on C. Rd. 26, 24 km. NE of Brock ville. The post office was established as Maynard in 1866, named after Moses Maynard Jr., an early Brockville merchant. In Edwardsburgh T., Leeds & Grenville Cs. on the St. Lawrence R. and C. Rd. 2, 2 km NE of Prescott. Pop. 237. In Augusta T., Leeds & Grenville Cs, on the St. Lawrence River and Hwy 2, 3 km. SW of Prescott. The residential suburb of Prescott was established in 1967. Between Prescott and Domville is the hamlet of Sparkle City. The place started in 1946 as a collection of tarpaper shacks, but then new homes were built and the lights from them at night ended the run-down appearance of the settlement. Pop. 3,995. In Augusta T., Leeds and Grenville Cs., on the St. Lawrence R. and C. Rd. 2, 2 km. SE of Hwy 401,26 km. NE of Brockville. Pop. 218. In Augusta T., Leeds and Grenville Cs., on Kemptville Cr. and C. Rds. 6 & 15, 24 km NW of Brockville. Pop. 557. In Elizabethtown T., United Cs. of Leeds and Grenville on C. Rds. 27 and 46,9 km. 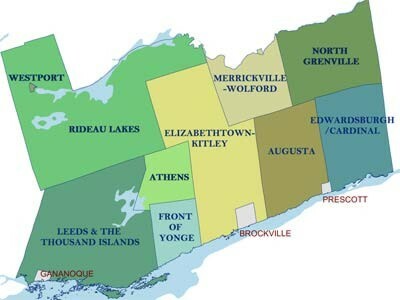 W of Brockville.